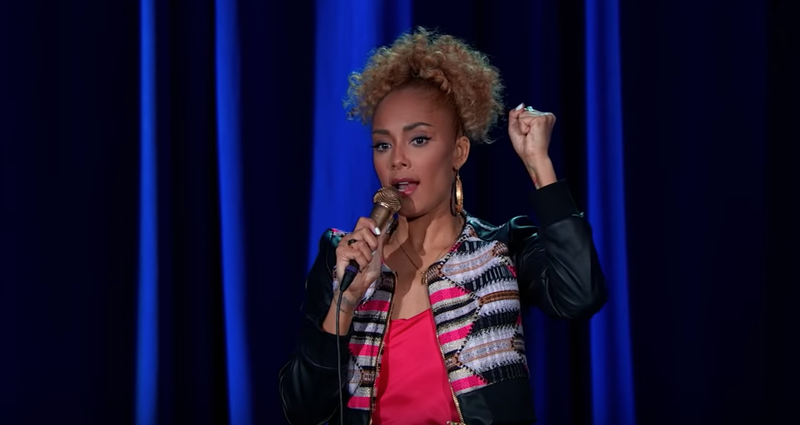 I first experienced Amanda Seales live and in action during the early iteration of her game show, Smart Funny & Black at Upright Citizens Brigade Theatre in Los Angeles. Since then, she has taken the popular game show on a multi-city tour. Now, Seales is leveling up even higher with more content: HBO’s Amanda Seales: I Be Knowin’. Riffing on topics such as utilizing the pep talk before going out (when you really don’t want to) and reminiscing on Barack Obama’s presidential win as a salve to the dumpster fire administration we’re currently experiencing, Seales brings her observational comedy to formulate an interactive experience, with an aura similar to her game show. After checking out an advanced screening of her special, I chatted with Seales on the phone about the show’s concept, the process of securing her special and what it means as a black woman in comedy, and the worst pickup line she’s ever heard. Oh, and I found out when her mixtape is coming out. Of course, comedians want as many eyes on their project as possible in general, but Seales was frank when it came to who she made her special for: black women. Seales also recalled the process of landing this special, noting HBO came to check out a few of her shows. That very show of confidence is when HBO got the message, and per Seales, they have been “very supportive” since hopping onboard with her. Additionally, Seales had a full circle-of-life moment, getting to shoot I Be Knowin’ in the same venue where she did Def Poetry Jam with legendary director and producer Stan Lathan, who is also involved in this special. Seales ain’t lying when she said this special is for black women, as she ponders on the frustrating phenomenon known as street harassment. Thus, I asked her to tell us the worst pickup line she received recently. It all began with a text. Once you watch the special, you’ll quickly find the blackest moment that’ll have you feeling like you were in the audience, experiencing it all, live. Just remember these two things: Lift Every Voice and Sing and double-clap. Seales told me she actually does have a track listing she sent to her homeboy. “Mark my words, it will happen!” she exclaimed. Amanda Seales: I Be Knowin’ debuts Saturday, January 26 at 10:00 p.m. ET/PT, exclusively on HBO.